Recently I moved to different country and opportunities for dating and meeting new women decreased as I did not manage to build circle of friends yet. I cannot say, before that time I was not interesting to women. But I've never been that guy who would walk to attractive woman on a street to start conversation with her or I was not completely confident around attractive women as I would like to be. For this reason, and also I do not like wasting whole nights out in the bars and clubs, next day with hangover. I could not have gone with PUA. Although I read some PUA stuff or subscribed some courses. They seemed to me to be superficial for solving the real problem, why I felt as I did. However, David's course Invincible explains this to the necessary detail and not only that. In individual chapters David explains how to open your true self, that happy, courageous and free one which naturally attracts women to you. 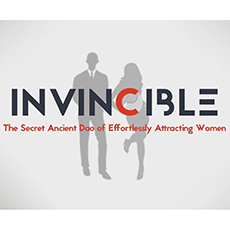 In addition to it, course also offers real, strong and simple technics how to attract women even more, who will already be attracted to you and your real character. One more think what I feel from Invincible course. His author really feels inner power of his members and tries to open it to full freedom.